Gender: Not male. Y’know. The kind that carries babies and such. Coat Color: A clean, pure white covers most of her body, mainly on the bottom half. The upper half is a dark, bold shade of grey. Here and there are small patches of lighter grey. Her ears are black, and there are also other black markings that trail across her back. To put in short, her whole pelt is in grayscale. Eye Color: Blue. A vast majority of different hues of blue... combined. How original right? (This being said, she’s most likely not pure wolf, but enough to be called as such). Body: Blue stands exactly 69 centimeters (a bit over 27 inches) at the shoulder, and weighs about 33 kilograms (72 pounds). Relatively average size for a female Gray wolf. Personality: Blue is a very playful individual. She often teases others, and at times can go a little overboard with it. Though, she is also capable at laughing at herself as well. Being rarely serious, the only exception being when disaster has struck/been foreseen, Blue is a fairly easy wolf to get along with. That is, if one doesn’t hate sarcasm. History: Blue was born into a fierce pack that claimed and clung to their territory along a long, wide river, living mainly on a firm diet of fish. All pups learned to swim nearly immediately after they even learn to walk. Blue herself was named after both the color of such waters, and the fact that even as she matured, her eyes never lost the blue tint all pups were born with. In fact, it just turned into several fiercer shades of blue. 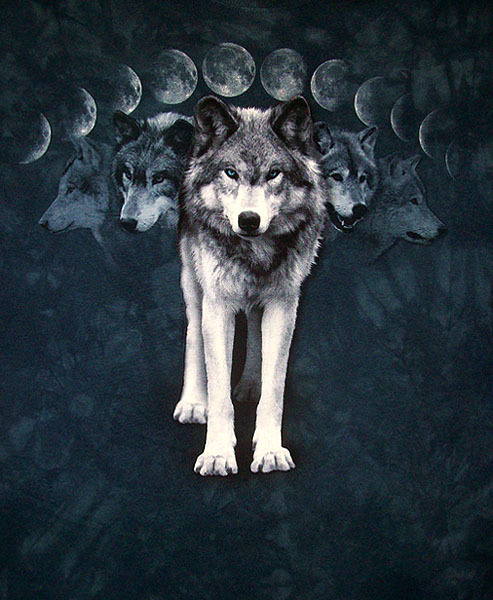 The pack members where a strict bunch of wolves, holding their never ending list of rules closest to their hearts, they frown most upon the ‘undisciplined’ pups such as Blue. Blue never seemed to notice though, only wanting to horse around with her brothers. Lucian, her father, caught on quickly, however, of the elders disapproving whispers about the new alpha’s first litter of pups. With intentions to force the pack’s traditions into his daughter’s head, Lucian set to work on lecturing Blue about the ways of the pack, and exactly why they held so tight to their rules. From then on, every time Blue ignored the packs traditions, following her own rules, she received another long, harsh lecture. Finally, after testing Lucian’s patience an abundant number of times, her father snapped. Lucian, not wanting his insolent daughter to ruin his well disciplined sons, separated Blue from her brothers at any time they were free to play with one another. Blue, left to play alone, took to running lone tiresome paths, and swimming anywhere possible, to build up her speed and endurance, which in time, helped calm her and gather her thoughts. Meanwhile, Reule, Blue’s oldest brother, took to doing anything possible to catch Lucian’s eye. Months later, making Blue and her siblings nearly one and a half years old, Blue receives her first vision of the future. She sees a lanky, dark grey wolf, crimson blood dripping off its fangs, standing over a heap of brown fur, stained with the same crimson as the lanky one’s fangs. The apple of her father’s eye, Reule, would soon be murdered cold blood by a sickly looking wolf. 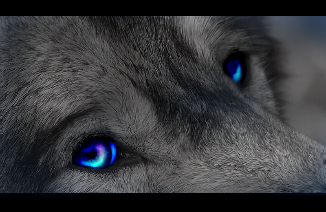 Blue, unsure of what to think about such a strange dream, went to tell the pack elders of her vision. The elders scoffed, and simply scolded her for dreaming when she could have been training. A week later, Reule was found dead at the border of the pack’s territory. The pack outraged, accused Blue of his murder. How else could she have known he was to die? Blue fled from her homeland, being pursued for days on end. Finally, after faking her death, her pack turned their backs and began walking their long way home. Blue wandered aimlessly across the land, before arriving at the door step of the Silver Snows Pack. The rest of her history is written there. Enemies: Her entire birth-pack, though it is doubtful they will come back for her. Mate: None I’m aware of. Likes: As stated before, she loves joking around with pack mates, and tends to pick favorites when picking on them. Blue also occasionally enjoys a long run, or swim. Oh, and snow. Snow above all. Dislikes: First comes bears, which seem to come back no matter how many times you chase them off... and of course, can tear you limb from limb. She can’t stand deadly serious wolves, who never want to play around. Talents: The gift of foresight. Strengths: Blue is quick to think, though it is mostly with smart retorts. Her top physical abilities include swimming and running. Emotionally, she is in whole, strong. She rarely breaks down from anger or grief, but instead cheers others up to fulfill her needs. Weaknesses: Blue has a habit of saying things without thinking through it first. She enjoys making smart-aleck comments when ever she feels the moment needs one. Her mouth will get her into trouble sometimes, and she doesn’t quite have iron-like muscles to rely on. I really cannot wait to meet Blue in the RP! GUUUURRL, I ORDER YOU TO CHANGE YOUR RANK. OR I NOM YOU. Katria wrote: GUUUURRL, I ORDER YOU TO CHANGE YOUR RANK. OR I NOM YOU. THIS BE MY WOLF BIO FOOL! She hasn't been promoted yet xD Hold your horses!